January 14, 2019 Yothin Wichetwichai, M.D. Burnout syndrome is not the same as depression. However, its symptoms do include feeling down, feeling stressed and a general lack of motivation to work. Factors associated with work play a major role in the accumulation of emotional stress, but what can quite easily cause burnout syndrome is the taking on of problems and how we deal with issues related to our job. A work-life balance can be created by finding a route out of your problems, consulting with an expert doctor in the field, or speaking with someone who has experience of the same issues you may be facing. When someone looks down, aloof or particularly quiet, we tend to first think of depression as being the cause. There are probably not many of us who would think that this person may be suffering from burnout syndrome, a condition which differs from depression as the sufferer only feels weary, uninspired, unmotivated and lacking in hunger with regard to their job. There are currently no clearly defined symptoms due to those suffering from burnout syndrome experiencing similar symptoms to depression, including feeling down, feeling stressed and lacking the motivation to go to work. Some people may display aggression or frustration when they are unable to work at the level they would like to. That being said, those who suffer from burnout syndrome are at a higher risk of developing depression than those who do not. However, this does not mean that all cases of burnout syndrome will lead to depression. Having too many responsibilities in the workplace could result in various negative aspects awaiting the sufferer. If workplace objectives are not met, this can lead to anxiety. Environmental factors, including a highly pressurized or constantly stressful working environment. Forcing yourself to do a job that you have not been trained to do, which you don’t enjoy or aren’t passionate about. Working in a way which causes you to feel fed up, either due to the work itself or your work colleagues. Being neglected, not being chosen for certain tasks or receiving a lowly salary. Working too much, overwork, as well as lacking the suitable tools or equipment to properly carry out your job. Working in an organization which has an unclear structure or which lacks stability. The length of time spent at work, such as working for more than 10 hours per day. Working too hard, meaning there is no time for adequate rest. Being the head of the family who is the main provider in terms of income, or taking sole responsibility for the care of elderly parents. Being someone who is easily stressed, being a perfectionist or expecting too much from your job. Withdrawing, not mixing with coworkers or possibly being too inflexible and wishing to exert your control over every aspect of your job. Moreover, burnout syndrome can also result in physical symptoms, such as insomnia, anxiety before going to work each day, feeling fatigued and exhausted, while headaches, nausea and an aching body are also possible. The effect of these symptoms is that workplace efficiency is reduced. In some cases, people may experience mood swings alongside feeling unsatisfied and disappointed with their work, while frustration may display itself in the form of disagreements with colleagues. If this situation escalates, it could lead to that person withdrawing from their workplace relationships, communicating less and lacking concentration as well as creativity. This could result in some people turning to alcohol, smoking, partying or getting to work late, thus also returning home later. Eat a healthy, balance diet and avoid stimulants, such as cigarettes, alcohol or drinking too much coffee. If you have a chance, take some holiday time off to give yourself some time away from work. Maintain a work-life balance and organize your time at work according to the importance of each task. Set yourself a time limit on how much work you will carry out each day and do not waste time on impossible tasks or outstanding jobs which may lead to you not completing any work at all. Ask others for their opinions and assistance, while also chatting to work colleagues in order to reduce stress levels. Avoid taking work home with you. Find a hobby which can help you relax on your days off. Exercise for at least 30 minutes per session, 5 times a week. Reduce the time you spend on social media as not only will this take up a lot of your time, but paying too much attention to what is happening online can also result in stress. However, this doesn’t mean that everybody is capable of adjusting something that may have affected them their whole life, or that people will be able to simply rearrange their own work-life balance, including the numerous external factors that we’re unable to control. If you feel that you are experiencing particularly severe indications which are resulting in physical and mental symptoms that are affecting your daily life, you should seek consultation with a specialist for some advice, or attend a doctor’s appointment for immediate diagnosis and treatment. 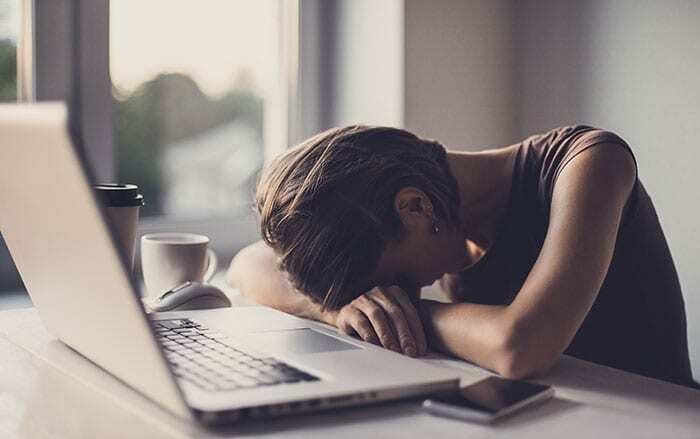 Do not overlook these symptoms as just being a mere inconvenience as if they are left untreated, feeling bored with work and burnout syndrome could potentially result in depression, a condition for which treatment is both difficult and complicated. Burnout Syndrome: A Condition That Seriously Affects a Person’s Ability to Work When someone looks down, aloof or particularly quiet, we tend to first think of depression as being the cause. There are probably not many of us who would think that this person may be suffering from burnout syndrome, a condition which differs from depression as the sufferer only feels weary, uninspired, unmotivated and lacking in hunger with regard to their job. M.D.,Faculty of Medicine, Thammasat University, 2002.